The difference between these two "Create new board..." options is not clear. It must have to do with ownership or membership but I tried creating boards in both categories and in each case I was the sole member and administrator of the new board. I have read through every topic on Trello Organizations in the Trello help center but found no mention of any difference between these two options for creating a new board. Is there any difference and, if so, what is it? I did some testing that seems to confirm my suspicion that there is no difference at all between the behavior of these UI elements. First, I created a "Test Account" user and added it to the organization. 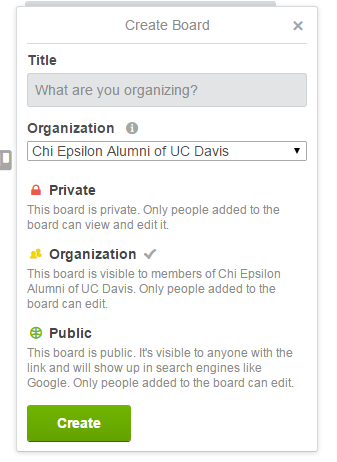 This new user sees the single existing organization board, listed under "Other Org-Visible Boards." 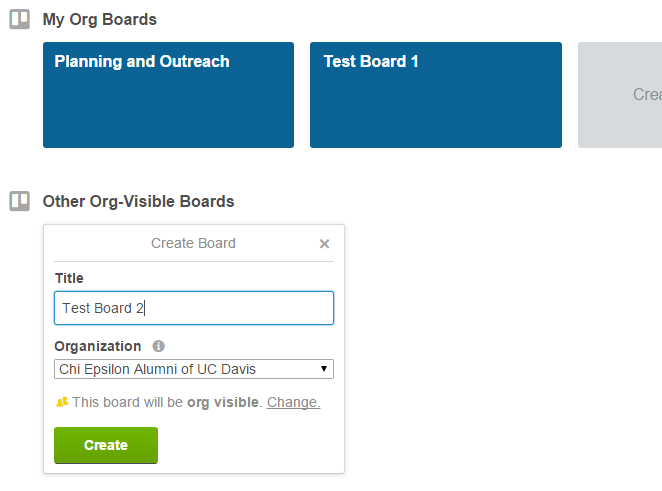 When logged in as "Test Account," on the other hand, all three boards are initially listed under "Other Org-Visible Boards:"
After joining a board, it moves from "Other Org-Visible Boards" to "My Org Boards" as expected; e.g., joining Test Board 2 causes it to move to "My Org Boards." 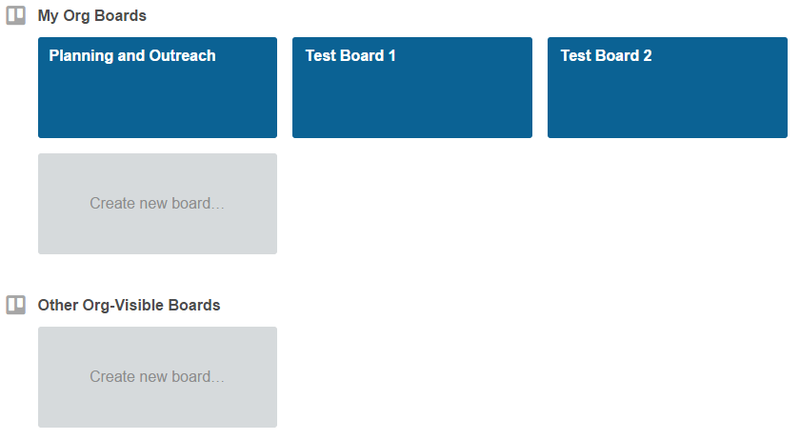 Out of curiosity, I repeated the process with the Test Account user creating the boards, and observed the exact same behavior; the user who creates the board is added as the initial board administrator and no other users are initially added to the board. This leads me to conclude that organization boards created using either link behave in the exact same way. Your selected Organization should be listed above the image you provided. 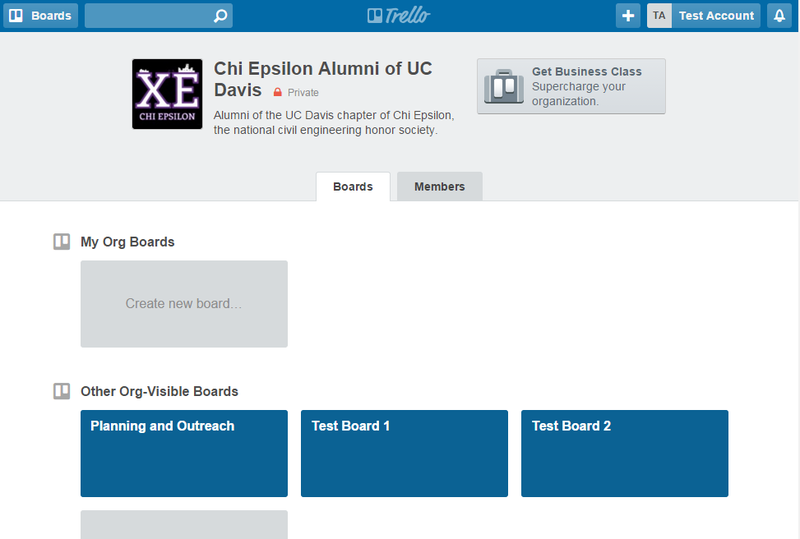 The "My Org Boards" lists boards that are accessible by anyone in your organization. 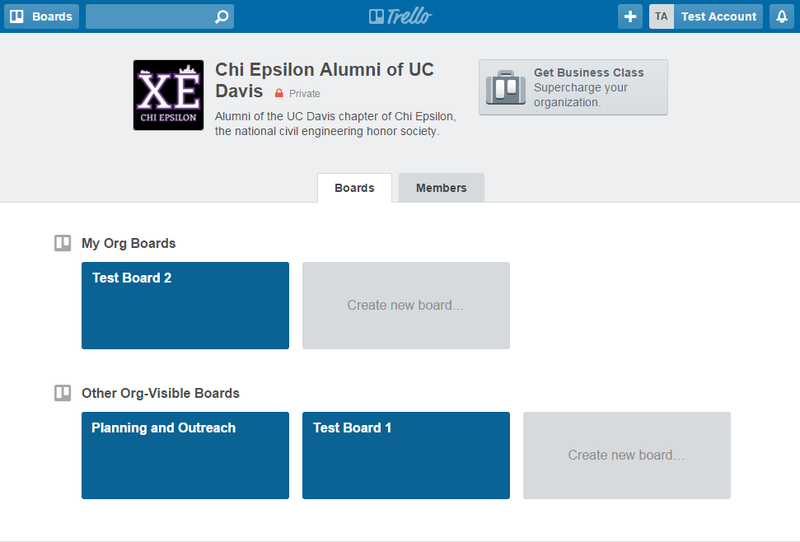 Use the Create board button here to create a board that is visible to all the organization. 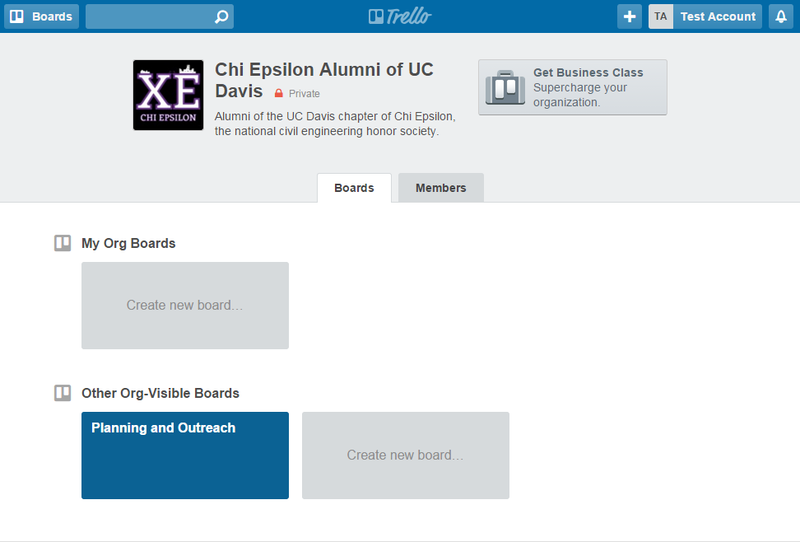 The "Other Org-Visible Boards" lists boards where one or more people from your organization can see and participate. 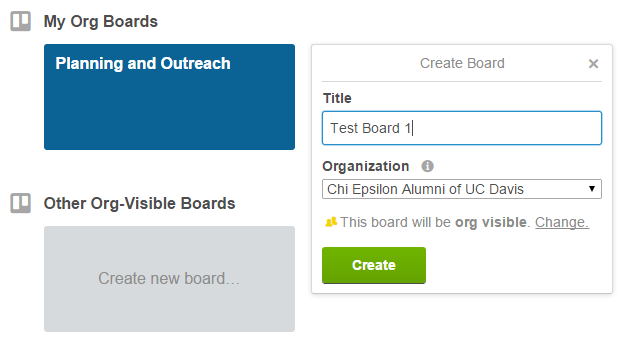 Use Create Board button here and then select people from the organization (or others outside of the organization) to participate. These are controlled or limited access boards. Not the answer you're looking for? Browse other questions tagged trello or ask your own question. 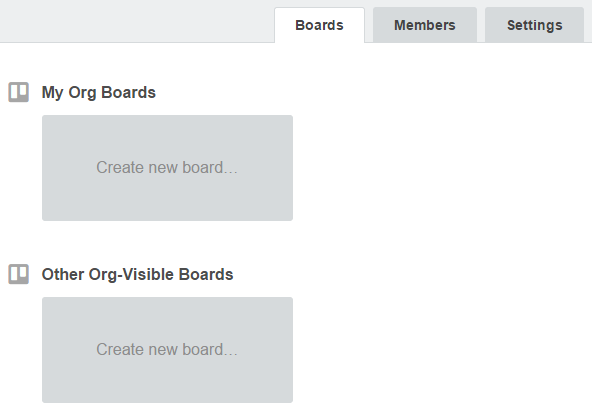 If I create an organization, can I limit what boards the members can see? Is there a way to allow more than one group of users 'read only' access to a board? How can I apply administrator right on more than one person in all the board of a Trello organisation?